Doctor Doom & The Fantastic Four vs Galactus…Say it isn’t so…A team-up for the ages. So get this, Doom has created a powerful character now known as Victorious(don’t care for the name). Her energy has drawn Galactus back to our world. Through out the story Doom’s plot unravels. 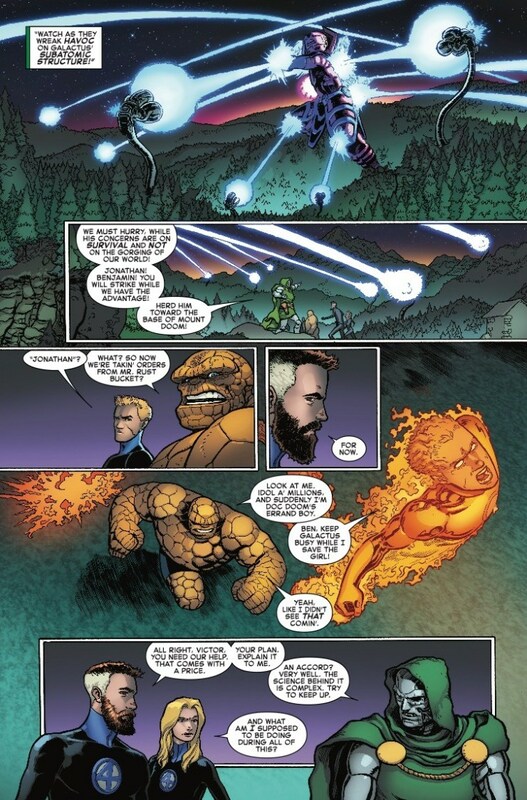 It’s a glorious tale with a battle worthy of the Fantastic Four’s lore. It’s interesting, during the story Reed simply has to catch up with the things that has happened while he was gone. You would have thought he would have interest in what occurred. I enjoyed Aaron Kuder’s art. I like the details he illustrates and how he depicts The Thing. He also does justice to the scale that Galactus tends to bring to any tale. The story also gets some time with Aunt Petunia, Valeria and Franklin. The end shows the Doom can be prepared for anything. It gives a Marvel Universe cliffhanger that has us hoping the next issue is just a solid.